Today's Guest Post was written by a fellow Foodbuzz Featured Publisher and fellow runner, Megan Kretz. I first "met" Megan after discovering that she tried my Montana Whoppers recipe. Then, by complete coincidence, we met in person last night at an event for Ocean Spray (post to follow, at some point...)! Megan is a fantastic girl and I can't wait to get to know her more through her blog and, hopefully, at more food events throughout the city. When you're finished reading Megan's Guest Post, you should check out her blog, The Runner's Kitchen. Thanks for writing, Megan! Over at my blog, The Runner's Kitchen, I write about running, cooking, and (mostly!) healthy eating. I love my veggies and whole grains, but every once in a while, I crave serious comfort food. Now that the weather's turning colder, it's the perfect time for heartier meals. I prefer to use the highest quality ingredients that I can get my hands on and I'm always trying to health-ify decadent dishes. Read on for some of my favorites! I cut the recipe in half so that it made 4 portions instead of 8; I used 2% milk instead of whole; and I used equal amounts of Gruyere and Cabot 50% reduced-fat cheddar (about 9 ounces total) and omitted the Brie. Most notably, I added some lightly cooked cauliflower florets to the pasta before topping it with the cheese sauce. The finished recipe was great! 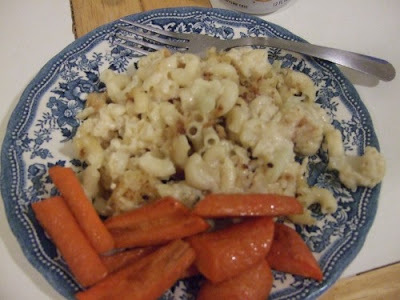 The picture given above shows the plate of my next-day leftovers with some roasted carrots. Yum! I'm currently trying out a vegetarian diet, but this Bison Meatloaf remains one of my favorite dishes. Bison is grass-fed, low in saturated fat, and very lean. All good things! Preheat oven to 300°. 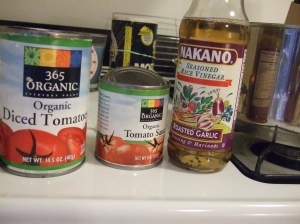 In a medium saucepan, combine tomato products, brown sugar, and vinegar. 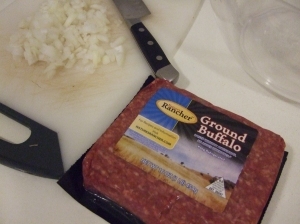 Mix together buffalo meat, 1/2 cup tomato mixture, egg, crumbled cracker, onion, salt, and pepper. Shape meat into a loaf shape in an 8" x 8" pan. Bake for 45 minutes. 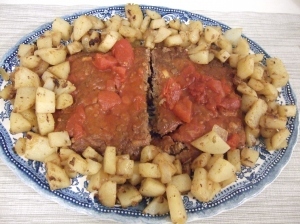 While meatloaf is baking, bring tomato mixture to a low boil and allow to thicken for 15 minutes. Ten minutes before the meatloaf is done, spread 1/3 cup tomato sauce on the top of the loaf. After the meatloaf is done baking, allow to cool in the pan for 10 minutes and then transfer to a serving platter. Serve extra tomato sauce on the side. Combine the potatoes, onion, garlic, and cumin in a large bowl. Melt butter in a large saucepan over medium-high heat and add the potato mixture. Cook for about 10 minutes, stirring frequently, scraping the brown bits off the bottom of the pan. Add vinegar and water and cook for another 6-8 minutes, or until all of the liquid is gone. Add salt and pepper to taste and serve! And, what's comfort food without some dessert?? 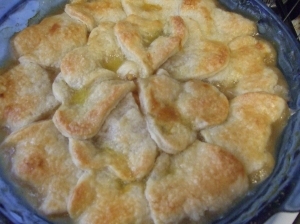 When I saw a recipe for heart-shaped crust Peach Cardamom Pie in Bon Appetit magazine, I knew I had to bake one for myself. I followed the directions exactly (no whole wheat flour substitutions this time...) because baking is so finicky. I think the result came out beautifully! The egg wash on the crust gave the pie a nicely browned finish and the absence of a bottom crust made it just a teeny bit healthier. Plus, I used local, organic fruit. Mmm... pie! 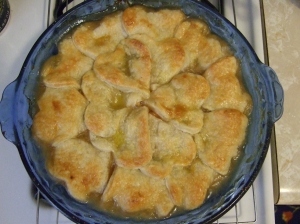 Although this pie is made with peaches (a summer stone fruit), you could easily substitute apples. If you use apples (I'd recommend a tart variety, such as Granny Smith), swap out 1/2 the cardamom for cinnamon.